Does this sound familiar? You apply the perfect makeup on your face, you leave out of the home, and after just a few hours, everything is a mess. Well, there is a simple answer to this, you haven’t used any makeup setting spray. While there are commercial brands that sell this type of products, we strongly recommend using a makeup setting spray. What does a makeup setting spray do? Well, for starters, it can hydrate your skin, but more importantly, keep your makeup in place. You will look fresh all day long. As mentioned, there are commercial products. Some are cheaper, some are more expensive. But if you use it regularly, it will get overpriced sooner rather than later. With that in mind, we advise you try a DIY makeup setting spray, which will cost just a fraction of the price of a commercial one. 1 What will you need? Before we get to the recipes, we have to stress the necessary tools you need to make a makeup setting spray. The first thing you’ll need is a bottle. You can use an old one or purchase. But it doesn’t make any difference, as long as it is a spray bottle. You will also need a small funnel, which will help you avoid any mess in the process of making the makeup setting spray. And last, but not least, you would need a teaspoon measuring spoon. And of course, some napkins to clean the mess. With that in mind, you are ready for making the spray. We will show you a couple of recipes. Some of them have more than 2 ingredients, and some have just two ingredients for an even cheaper option. This is one of the most common recipes for a makeup spray. It utilizes some of the more beneficial ingredients for your skin, like rose water. The water will add hydration to your skin, and we recommend using as much as you like. Here is how to make this spray. 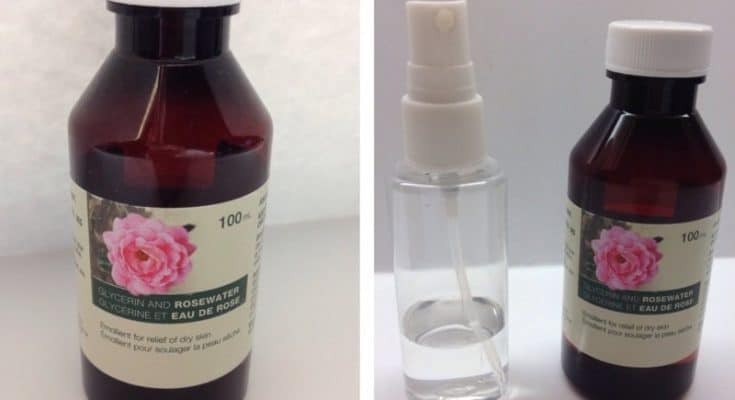 This is an alternative version for those who want to make their makeup spray without glycerin. If you have oily skin, you definitely want less glycerin. And if you prefer a matte finish, this recipe is also great for you. You can use this spray for keeping your makeup, but also as a hydrating mist. Shake this spray before each use. If you want to use it as a natural setting spray, just hold it at about 18” from your face, and lightly mist over makeup. If you want to make your makeup last longer, use it before finishing powder. Or, if you want a more dewy finish, apply after your setting or finishing powder. As mentioned, you can use it as a hydrating mist as well. Just spray it on your face to soothe and hydrate your skin. Because it is great for hydration, you can also prepare one in a smaller bottle as a travel-friendly hydration mist. We noticed witch hazel extract is present in most of the recipes. 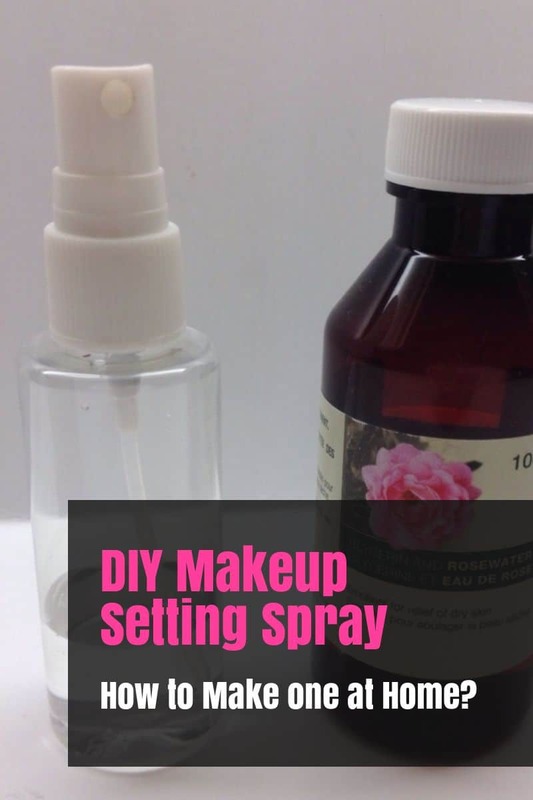 But you can also make a makeup setting spray with witch hazel as the main ingredient. The ingredient has skin calming and pore-unclogging properties. And because it is a natural antimicrobial agent, it can help control excess oil, prevent acne, prevent bacteria skin issues, and diminish the appearance of large pores. The main use of a makeup setting spray is to make your makeup last longer. You do this by setting your makeup once you finish putting it on. But there are also other uses. For example, you can use it multiple times throughout the makeup application process to seal each makeup step. For example, use it after you prepare your skin like a primer. Spray the solution on your face, let it soak for a few minutes, and then apply makeup. And then spray it after applying foundation to ensure setting your makeup. You can also use it to freshen up and revitalize your makeup throughout the day. There is no need for reapplying makeup, just spray some setting spray. If you are looking for a more glow to your makeup, you can add illuminating drops into your makeup spray. This will give you a super highlighted look. But be careful, start small, so that your face does not look like a disco ball. Illuminating drops are great for the summer. And if you prefer a more fragrant spray, add a few drops of your favorite essential oil to the makeup spray. Always use a quality that is safe for your skin. Be careful if you have sensitive skin. Some of the best options include lavender and lemon essential oil. Lavender smells great and brings a lot of health benefits to your skin. If you have some skin problems, you can add tea tree essential oil.